Automakers are clamoring to put an electric SUV into production. Jaguar has already and Audi is . 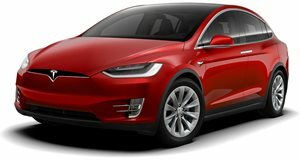 Even with the financial might of Tata and Volkswagen backing them up, it seems like Jaguar and Audi have been beaten to market by a small company based in Georgia called Green4U Technologies. You may not recognize the name Green4U, but the company's co-founder, Don Panoz, might ring a bell, as he's the guy who founded Panoz. Panoz was known for a few interesting sports cars like the Esperante and Avezzano. Now Green4U has announced two electric SUV models that it plans to deliver by mid-2018. Dubbed the MTU-6 and Enova, both have a unique six-door configuration. The MTU-6 looks a lot like a classic Land Rover Defender, and is based on an aluminum truck chassis designed by Green4U. Company CEO Jack Perkowski told that the MTU-6 will have 230 miles of range, and is designed for utilitarian off-road use. The company even showed it to the US army to gauge their interest in the vehicle for military use. The MTU-6 platform is modular, and can be configured to produce several vehicle types including a pickup truck. Green4U also has another model called the Enova, which is mainly focused on Taxi services. The Enova is based on the same chassis as the MTU-6, but looks more like a traditional crossover. Both models were designed as commercial fleet vehicles, so the six-door layout is meant to provide easy access to the rear seats. Even if we can't buy them, we have to be impressed that this small company was able to crank out two EV SUVs for around $70,000 each. If consumers like the vehicles, Perkowski says that he'd be open to selling to private buyers. Perkowski says several private parties have already expressed interest. Green4U was able to decrease manufacturing complications by basing the two SUVs off existing Chinese designs, helping it get the models to market so quickly. These SUVs may not look as futuristic or luxurious as a Tesla Model X, but they are a realistic option in a market with very few electric SUVs.